A recently released international study has found small businesses lose almost twice as much to occupational fraud – per case – as large businesses (over 100 employees). Every two years the Association of Certified Fraud Examiners (ACFE) produces its Report to the Nations: Global study on occupational fraud and abuse. To help you mitigate against and protect your business from employee fraud, we have created a downloadable version of the 2018 ACFE report’s ‘Fraud Prevention Checklist’. 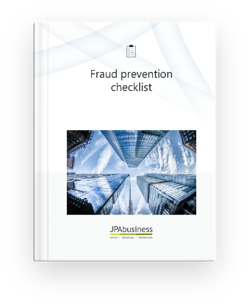 The checklist is designed to help you consider and test the effectiveness of your organisation’s fraud prevention measures. For more information about employee fraud, take a look at our 2016 eBook: Employee fraud: 15 strategies to reduce the risk. If you would like support to develop a sound business culture and operational practices and checks that will underpin a fraud prevention strategy for your business, contact the team at JPAbusiness on 02 6360 0360 for a confidential discussion.